Facial Nerve is a mixed (i.e. motor and sensory) nerve, but mainly it’s motor. Facial nerve is the 7th cranial nerve. It’s referred to as facial nerve as it supplies the muscles of facial expression. It’s the most regularly paralyzed of all the peripheral nerves of the body. Special visceral efferent fibres: They supply the muscles of facial expression and originate from the motor nucleus of the facial nerve in the pons. 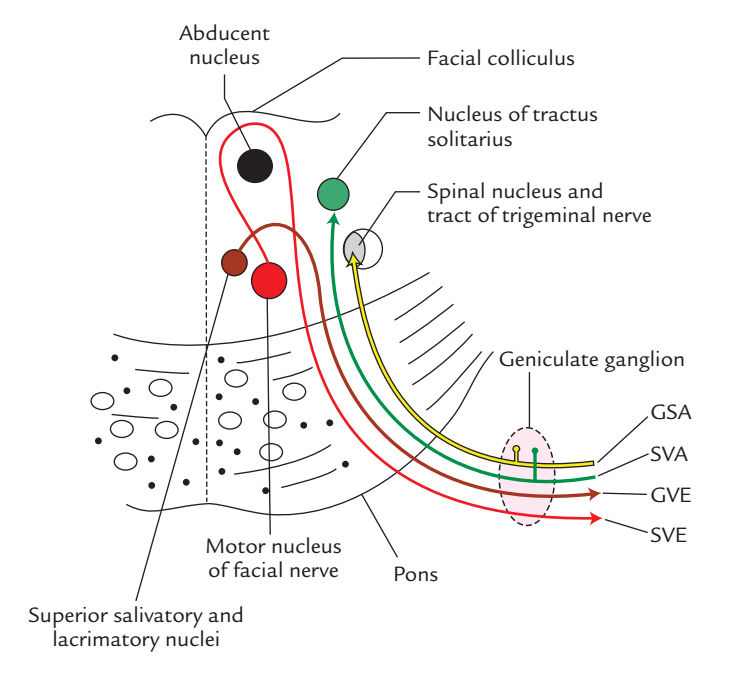 Special visceral afferent fibres: They carry unique sensations of flavor from anterior two-third of the tongue with the exception of vallate papillae and terminate in the nucleus of tractus solitarius (gustatory nucleus) in the brainstem. General somatic afferent fibres: They carry general sensations from the skin of the auricle and terminate in the spinal nucleus of the trigeminal nerve. The cell bodies of SVA and GVA fibres can be found in the geniculate ganglion. Facial nerve includes two distinct roots, a large medial motor root (the facial nerve appropriate) and a small lateral sensory root (the nervous intermedius). The two roots originate from the pontomedullary junction lateral to the superior end of the olive of the medulla. The sensory root is located between the motor root of facial medially and the vestibulocochlear nerve laterally. After appearing from the brainstem, the roots of the facial nerve pass laterally and forwards in the cerebello-pontine angle, alongside the vestibulocochlear and labyrinthine artery. All these structures subsequently travel into the internal acoustic meatus. In the meatus, the motor root is lodged in a groove on the vestibulocochlear nerve, while the sensory root stays independent. At the lateral end (underside) of the internal acoustic meatus, 2 roots connect to create the trunk of the facial nerve. (Here it’s essential to notice the backside or fundus of the internal acoustic meatus creates the medial wall of the bony labyrinth of the internal ear.) The facial nerve enters the facial canal in the petrous temporal bone through its opening in the fundus of the internal acoustic meatus. The facial ducts split into three sections: labyrinthine, tympanic and mastoid. The labyrinthine segment of the facial canal is located above the vestibule of bony labyrinth and bends to get to the anterosuperior part of the medial wall of the middle ear (tympanum) near the processus cochleariformis. Here the canal bends sharply backwards. The facial nerve coursing via the labyrinthine section of canal also makes a sudden curve termed the external genu of the facial nerve which possesses the geniculate ganglion. The tympanic segment of the facial canal runs horizontally backward in the medial wall of the middle ear till it reaches the junction of the medial and posterior wall of the middle ear. The bulge of the tympanic segment of the facial canal is viewed in the medial wall of the middle ear above the promontory and fenestra vestibuli and below the bulge created by the lateral semicircular canal. The mastoid section starts at the junction of the medial and posterior wall of the middle ear and enters vertically downward in the posterior wall of the middle ear till it reaches the stylomastoid foramen at the base of the skull. The facial nerve comes out of cranial cavity via the stylomastoid foramen. 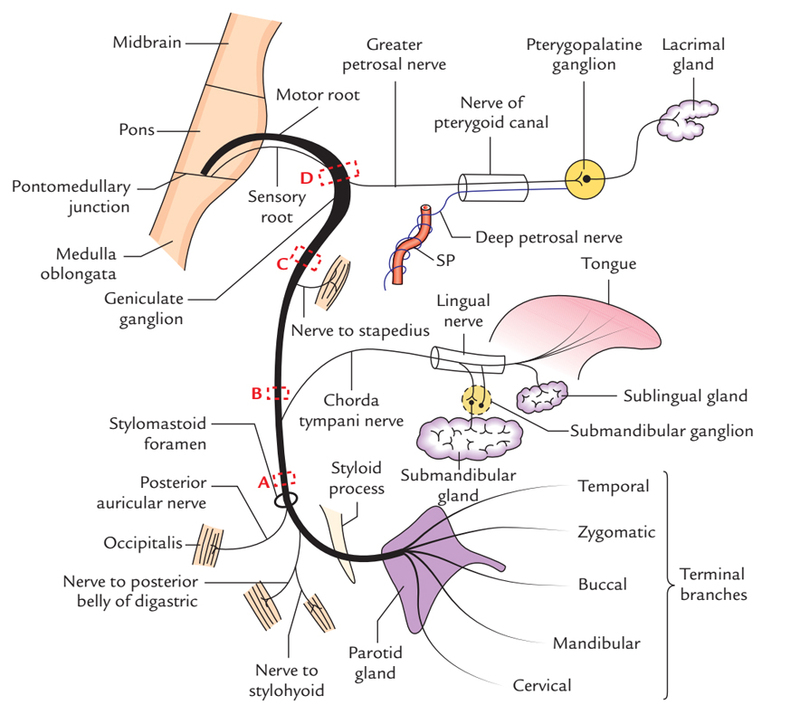 Greater petrosal nerve originates from the geniculate ganglion. It is composed of preganglionic parasympathetic fibres which relay in the pterygopalatine ganglion and supply the secretomotor fibres to the lacrimal gland and the mucous glands of nasal cavity and palate. Nerve to stapedius originates from the vertical part of the facial nerve opposite the pyramidal eminence, runs forwards via a brief canal inside it to get to the stapedius muscle to supply it. Chorda tympani nerve originates from the vertical part of the facial nerve about 6 millimeters above the stylomastoid foramen and enters the middle ear via the posterior canaliculus (on the posterior wall of the middle ear), runs across its lateral wall of the middle ear (pars flaccida of the tympanic membrane); passing between the long process of incus and the handle of malleus and makes the middle ear by going into the anterior canaliculus (on the anterior wall of the middle ear). It then traverses via the bony canaliculus and enters the inferotemporal fossa via the medial end of petrotympanic fissure. After coming from the petrotympanic fissure, it runs medially forward and downward, crossing the medial aspect of the spine of sphenoid, to join the posterior aspect of the lingual nerve. Preganglionic parasympathetic (GVE) fibres, which supply secretoMotor Supply to the submandibular and sublingual glands. Special visceral afferent fibres, which carry taste sensations from anterior two-third of the tongue. Posterior auricular nerve supplies the occipital belly of occipitofrontalis. Nerve to the posterior abdomen of digastric supplies the involved muscle. Nerve to stylohyoid supplies the involved muscle. five terminal branches (temporal, zygomatic, buccal, marginal, mandibular and cervical) supply the muscles of facial expression. These can be supranuclear or infranuclear. 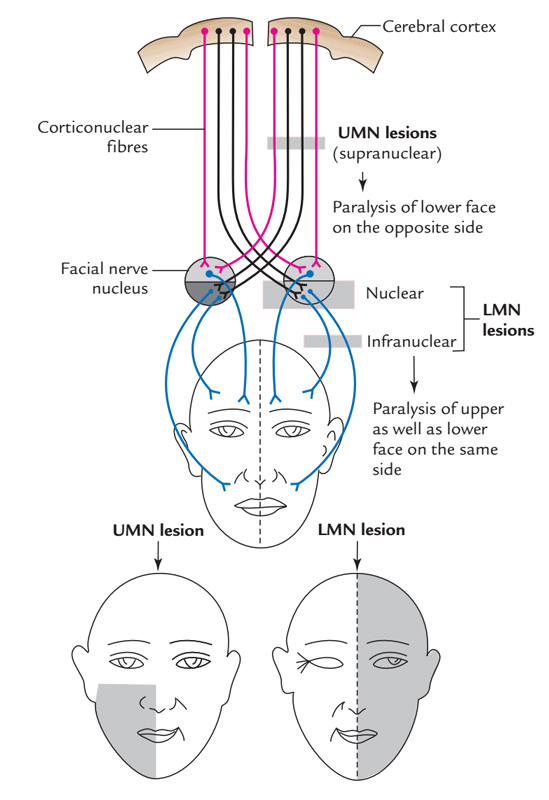 A supranuclear lesion (i.e., in hemiplegia) spares the upper part of the face because nuclear fibres supplying the muscles of the upper part of the face are innervated by the corticonuclear fibres of both the cerebral hemispheres. In the supranuclear lesion, only lower half of the face on the opposite side is paralyzed. All intranuclear lesions require entire of the face on precisely the same side. Site A At or just above the stylomastoid foramen: It causes Bell’s palsy which presents as loss of motor functions of all muscles of facial expression resulting in the deviation of mouth toward the normal side, inability to shut the mouth and eye and accumulation of food in the vestibule of mouth flattening of expression lines. Site B Above the origin of chorda tympani: All the signs and symptoms of lesion A (i.e., Bell’s palsy) plus reduced salivation and reduction of taste sensations in the anterior two-third of the tongue. Site C Above the origin of nerve to stapedius: All the signs and symptoms of lesion B plus hyperacusis (i.e., increased susceptibility to hearing). Site D At the geniculate ganglion: All the signs and symptoms of lesion C plus reduction of lacrimation. Herpetic vesicles on the auricle. Loss of taste sensations in the anterior two-third of the tongue. Whole ipsilateral facial palsy (Bell’s palsy).